I suppose the first thing to highlight in this review is that, as you might have guessed, there is going to be a second 1-4x Leatherwood scope in the near future. My e-mail from their president seems to indicate that this scope will be called the DMR though I had it in my notes from Shot as the CMR 4. This is probably as good a time as any to mention that Leatherwood was the last stop of day 2 for me and I was substantially rushed by the impending closing of Shot for the day. Unfortunately, I never got back and the time crunch, coupled with the elapsed time since, has made my notes and my mind a bit foggy on some details. Nevertheless, I shall tell you what I know. I do not guarantee any perfection or clarity in these little Shot blurbs. They are just that, blurbs, any quality is purely coincidental and will not be repeated. Externally, the new scope appears very similar to the original CMR. The differences have more to do with functionality than with appearance. 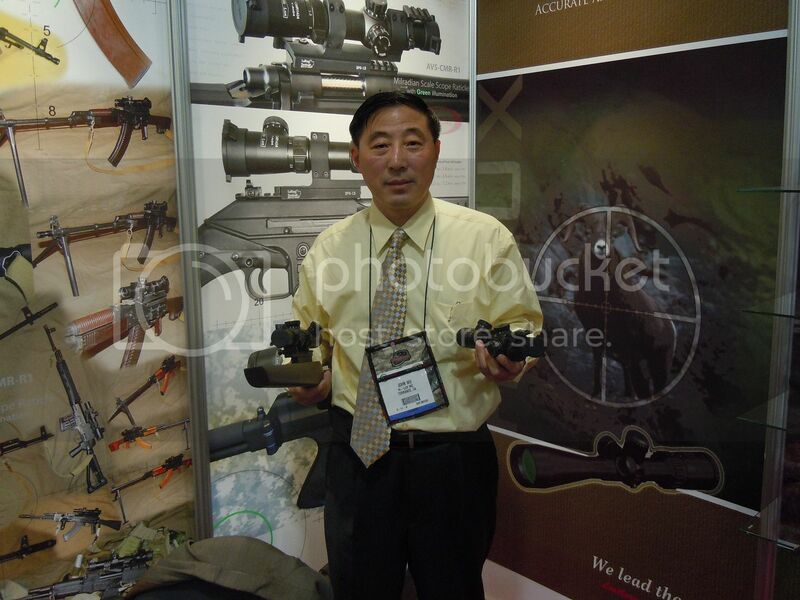 Actually, in the below photo of the Leatherwood president holding both optics, I am not totally sure which is which. I think the scope without the add on rail is the old model, but I could be wrong. 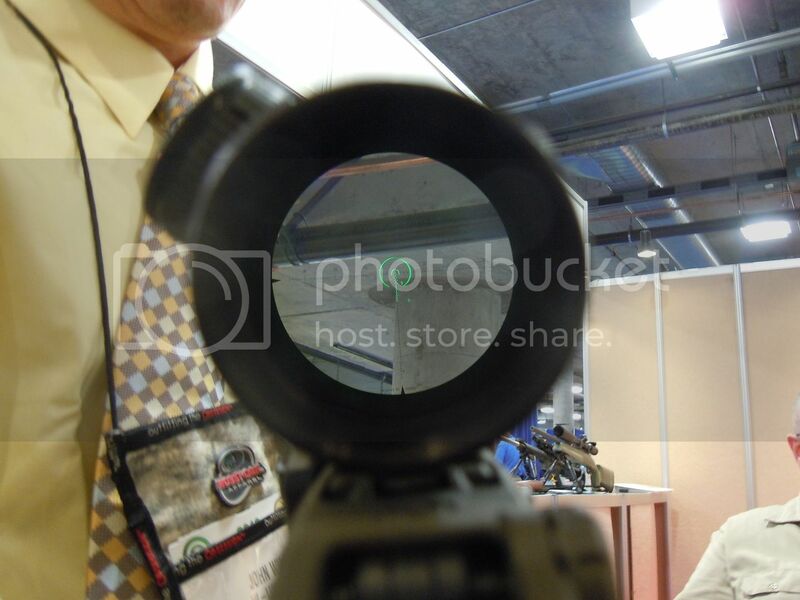 I do know that the through the scope pictures are of the new optic and you will notice that the illumination scheme is slightly different as well as the reticle itself. Previously, only the horseshoe portion illuminated. On the new scope, the horseshoe and bdc portions illuminate though not brightly. You will also note that a mill ladder now appears below the bdc portion as well as to the left and right of the central portion. I applaud Leatherwoods dual mode, stadia and calculation, ranging system. This has been improved on the DMR and the adjustments have been changed to mil from 1/2 moa. Now, you are no doubt thinking, at this point, that a switch from MOA to mil and a few tweaks to the reticle are not enough to justify the $599 msrp on the DMR vs. the $320, with mount, street price on the CMR. I assure you that, despite the similarities in the design of the optical system, they are not made with the same components. The new DMR has significantly improved clarity as well as better adjustments. The clarity is not that of the $1k reference GRSC but is better than the CMR. The turrets actually feel very good on the DMR. They are now capped and slightly smaller than the original CMR but the big difference is that they feel solid instead of a bit soft and squidgey. Both scopes have smooth power and diopter rings and they both have an interesting integrated cat tale that can be installed by the user on the power ring. 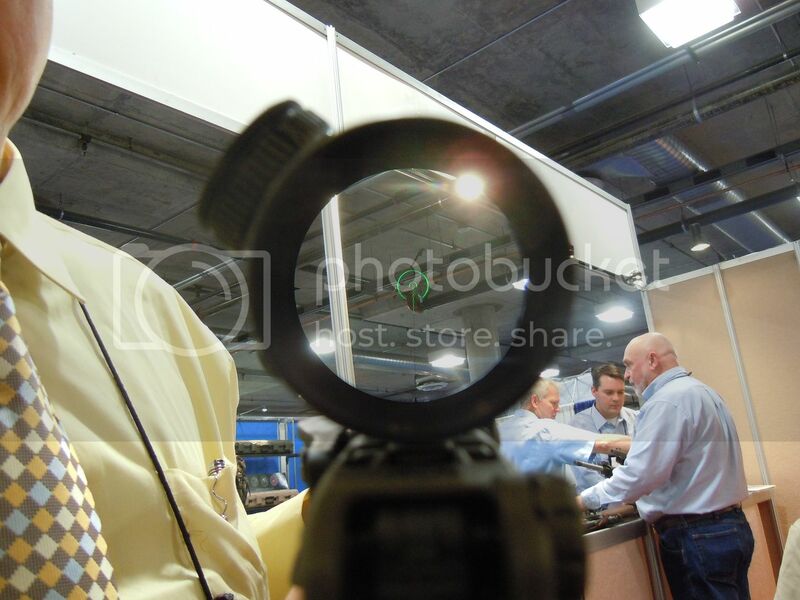 When the CMR first hit the market, about a year and a half ago, I expected, based primarily on the reticle, great success. From what the Leatherwood folks have told me this has been the case. Reviews on forums, such as this one, have delivered them something of a word of mouth advertising campaign. I remember following this, with some interest, last year and all of the reviews I have read have been good. Given the number of reviews, this is a very good testament to the durability of the product. 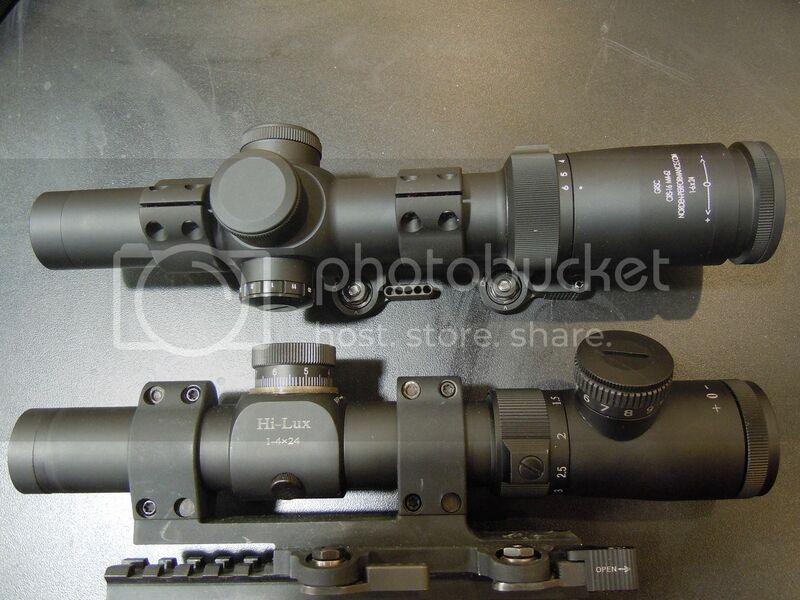 Durability is always the primary concern for optics in this price range. While both optics do not over deliver on optical performance, mechanical performance, or illumination relative to other optics at their price ranges they do deliver better reticles and features than most and seem to be, in the case of the CMR, holding up well. I see no reason why the prospective buyer should expect unhappiness from these optics. It is very likely that I will be doing a full review of at least one of the Leatherwood scopes in the near future so stay tuned. The DMR next to the GRSC reference scope.